Today's a what's wrong post. So who's suggesting that childhood obesity is preventable by encouraging kids to play marbles and hide and seek? It's the Local Government Association (LGA) of England of which represents more than 400 councils in England and Wales. "Top Ten playground games to (hop)scotch obesity levels"
Want to know what made the top ten? * What’s the Time, Mr Wolf? I'll reiterate for newer readers. I'm all for exercise. It's perhaps one of the single most important determinants of health and we should be doing all we can to promote more of it. The issue I've got is suggesting that exercise is going to have an impact on childhood obesity rates. 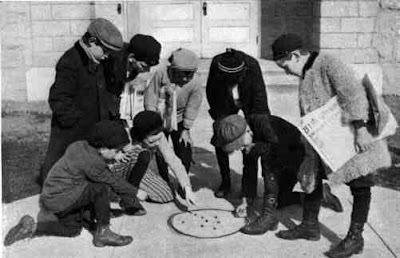 A press release that suggests that a spirited, rip-roaring game of marbles is going to help stem the tide of childhood obesity.